This UL Listed USB Custom Car Charger is available in 5 eye-catching metallic colors and charges most USB compatible devices. Your logo will be seen every time the recipient needs to power up! Keep your cords organized with this Full Color Toddy Gear Custom Tie Cord Organizer. It comes in a variety of colors, and will make sure your cables don't get tangled! 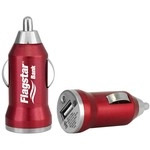 Don't leave home without taking this handy USB car adapter cell phone custom charger imprinted with your brand message with you.